A continued side effect to all the Legends of Tomorrow setup from the first half of Arrow Season 4 has seen a fair amount of story details glossed over, notably when it comes to Damien Darhk, and in particular our ability to make any sense of Diggle’s brother Andy. 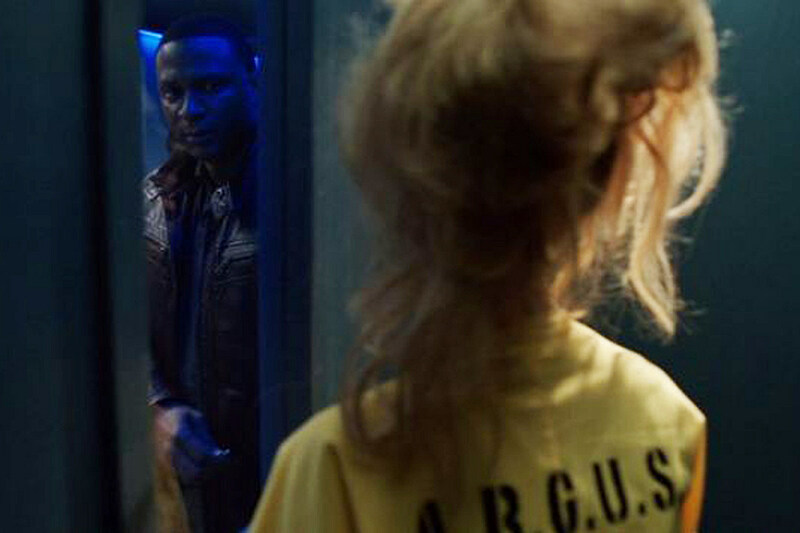 Last week’s “Blood Debts” at least started to answer that question by suggesting that the character’s attitude had more to do with his and Diggle’s troubled history than an outright brainwashing, which unfortunately put the Diggle brothers-centric “A.W.O.L” on some shaky ground to start with. Diggle-focused hours are few and far between as it is, often cramming flashbacks with details that Oliver’s story would take weeks to let unfold, though “A.W.O.L” definitely did well to show more of the brothers’ relationship than we’ve ever seen before. As I mentioned last week, front-loading Season 4 with a “who’s in the grave” mystery tends to pull focus from the moments at hand, keeping visible crosshairs* on characters like Andy or Lyla, and thereby robbing a bit of the redemption arc the hour seemed to try setting up. If nothing else, “A.W.O.L” at least drew some strong through-lines, to open on Diggle and Lyla, and close with welcoming Andy into their home after trust earned in the Shadowspire fight. *The comic character has surely come back from worse, but say goodbye to Cynthia Addai-Robinson’s Amanda Waller, latest victim of the Suicide Squad movie eliminating its TV counterparts. “Deranged Squad Female” better watch her back. Because these early 2016 episodes have so much competing for attention however, much of the Diggle family saga ended up a bit overshadowed by the aftermath of a paralyzed Felicity returning home, and slowly easing back into her duties helping the team by remote. Arrow isn’t the type to lean too heavily into a lifelong* adjustment like paraplegia, but it was nice to see at least some of the experience reflected in non-super moments, that for all her intact computer skills, the trauma still rattles her, and turns taken-for-granted tasks like a coffee run that much more complicated. *There’s a lot to be said of Oliver this episode; the writing admirably keeping he and Felicity strong through such a trying ordeal (making their future angst all the more ominous), or the awkward shoehorn of Barry’s time-travel warning, but the closing Oliver and Felicity scene felt more than a little off. Lampshading paralysis in a world of such super-happenings was probably inevitable, but Oliver’s vow to find some deus-ex-machina treatment felt like a tremendous cheat to justify reversing her paralysis sometime this season. What really struck out, however, was the return of “Goth Felicity” as some sort of taunting hallucination, particularly without any additional suggestion of having taken too much medication, or perhaps influence from Damien Darhk. Felicity is an incredible character to have built up over the last four years, more than worthy of exploring both a sense of identity as well as her recent trauma, and it isn’t as if she has thugs to toss around as part of the healing process, like her teammates. A few rounds with whoever thought this up might help, admittedly. Felicity’s hurdles are always cerebral, and I can also understand the gimmick value of Emily Bett Rickards dressing up to act opposite herself, but all the exchanges felt crazy awkward and on-the-nose in context. Worse, even, that we weren’t ultimately privy to her catharsis anyway, jumping straight into her return to the lair to trade inspiring speeches with Oliver. The split focus between didn’t leave much for “A.W.O.L” to take away overall, mostly serving to put Felicity back in the game with a clever new codename, and potentially shake things up at A.R.G.U.S., if we’re to take Lyla’s “promotion” at face value. No Quentin, Donna, Damien or anything on the campaign this week, so hopefully “A.W.O.L” will serve more than to widen the target on Andy (or yikes, Diggle)’s back. Yes, Felicity finally got her codename, cleverly referencing executive producer Marc Guggenheim’s “Overwatch” novel. Nodding to the “Oracle” name being taken was cute, but darn it all if the show ever clarifies who, or what Oliver was referring to in-context. Not that I remember if Diggle’s station ever changed, but way to reuse that stretch of “Afghanistan” road, guys! I don’t know what’s stranger, Oliver’s failure to notice Felicity flipping out at a hallucination just over his shoulder, or wordlessly walking away when she yells at it. You know they’re deliberately upping Laurel and Oliver scenes to build toward another romance, right? Oliver referencing Barry’s time-travel seemed awkward enough, that I’ll forgive Laurel not mentioning her sister’s equally absurd exit last week. What is this universe’s obsession with feeding prisoners Big Belly Burger? And do they at least give Andy a mattress at night, that never appears in any other scene? Arrow Season 4 will return February 3 with “Unchained”, airing at 8:00 P.M. on The CW.